Emperor Lebna Dengel of Ethiopia, also known as Dawit II, or David II, was one of the celebrated Christian kings of Ethiopia. Lebna Dengel succeeded to the throne of Ethiopia at the age of 12, partly through the maneuverings of his grandmother, the empress Eleni. The empress was the daughter of King Hadiya, a Muslim, and she officially served as Lebna Dengel’s regent. Eleni had begun her rise to power when she became one of the four wives of Zara Yakob (1438–68) in 1445, thereby joining her prominent Muslim family with the Christian family of Zara Yakob. As one of the celebrated evangelizing emperors of Ethiopia, along with Amda Tseyon (1314–44) and Sayfa Arad (1344–72), Zara Yakob holds a unique place in Ethiopian history. When he built a new royal residence at Debre Berhan, Eleni, who had converted to Christianity, established a church on the grounds. Zara Yakob died after designating his young son Ba’eda Maryam (1468–78) as his heir, and Eleni became even more prominent in Ethiopian politics. Since his mother was dead, Ba’eda Maryam designated Eleni, to whom he was close, as the queen mother and chose her to serve as his regent. Eleni also served in this capacity during the troubled reign of her son Na’od (1494–1505), who had succeeded his half brother Ba’eda Maryam to the throne. When Na’od was killed in a battle against the Muslims, his son Lebna Dengel was only seven years old. Throughout much of the late 15th and early 16th centuries, Eleni served as the power behind the Ethiopian throne, essentially serving as the reigning monarch. As a devout and active Christian, Eleni is credited with founding the modern church of Ethiopia. Although her exact birth date is unknown, Eleni was born sometime in the 1430s and died in the early 1520s in her 90s. While Christians and Muslims coexisted in Ethiopia during Lebna Dengel’s reign, it was far from a peaceful relationship. In 1516, when the emir Mahfuz of Haran invaded the Ethiopian highlands, Lebna Dengel ambushed the invaders and continued to press his advantage by killing the emir and following them back to Haran, where he again attacked. Lebna Dengel returned to his home a hero, convinced that the Muslims would no longer threaten Ethiopian Christians. He was fatally wrong. Suspecting that a Muslim attack was imminent, Eleni sent out a plea for assistance from Portugal. Consequently, in 1520, a Portuguese expeditionary force arrived in Ethiopia, led by Dom Ridrigo da Lama. Despite the presence of the Portuguese in Ethiopia, in March 1529, Muslim forces under Ahmed Ibn Ghazi (c. 1507–43), popularly known as “the Gran,” triumphed over Lebna Dengel’s forces. By 1531, Muslim forces were in control of Ethiopia and remained so until 1543. During the period of Muslim dominance, Emperor Lebna Dengel actively resisted all efforts to make him renounce his faith. When Ahmed ibn Ghazi demanded the hand of Lebna Dengel’s daughter in marriage, warning Lebna Dengel that he had no other course than to comply, the emperor summarily refused. Assuring the Gran that he would not allow his daughter to marry a nonbeliever, Lebna Dengel wrote to him that he was determined to retain his trust in the Lord rather than in the Gran. Afterward, Lebna Dengel’s faith was repeatedly tested as he was forced to flee for his life. For the rest of his life, he was often hungry, uncomfortable, and in physical danger. Lebna Dengel was still hiding from Muslim forces when he was killed in battle on September 2, 1540, near the monastery of Dabra Dam in Tigre. Subsequently, the tide turned for Christian Ethiopians. Lebna Dengel had appealed to Portugal for assistance in 1535, but help did not arrive until after his death. 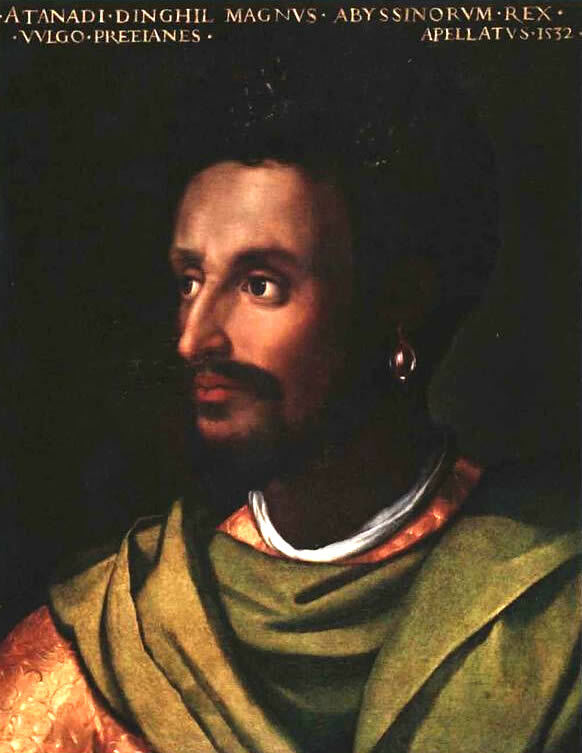 The emperor Galawdewos (Claudius) succeeded to his father’s throne, and the Ethiopian Empire was restored with the help of the Portuguese who arrived in Ethiopia in 1541. This force of 400 Portuguese musketeers was led by Cristóvão da Gama, the son of the celebrated explorer Vasco da Gama. After Lebna Dengel’s death, his son Galawdewos, assisted by the Portuguese musketeers, led an attack in which the Gran was killed in 1543 in a battle near Lake Tana. Once the Muslims were ousted, the Christians performed a penitential and reinstatement ceremony and proclaimed the return of Christianity to Ethiopia. Although the Muslims had been ousted from Ethiopia, the Gran’s widow, Bati Del Wambara, continued raids on the Christians. Galawdewos was killed in battle in 1559, and the Muslims triumphantly displayed his head on a stake. Many of the Portuguese who survived the various battles remained in Ethiopia when the troops pulled out of Ethiopia in 1547. They were soon joined by a group of Jesuit missionaries. The presence of the Portuguese was evident in Ethiopia in a number of ways since the Portuguese government fully intended to retain a certain amount of power in the country The Portuguese taught the Ethiopian soldiers how to use firearms and converted a number of locals to Western Catholicism. By the mid-17th century, however, the Ethiopian government had expelled the Jesuits and denied other missionaries admission to the country. For the next two centuries, Ethiopia rejected all foreign overtures, preferring to exist in isolation.